After meeting sewing teacher, Diana Stasko from "Better Living Through Sewing" from Northern Calif, and showing her the work I had done up to this point, she quickly came to the conclusion that I needed to customize the pattern to my bust size. She said, most any pattern needs to be customized, if over a B cup size. That means I will be customizing everything from now on. 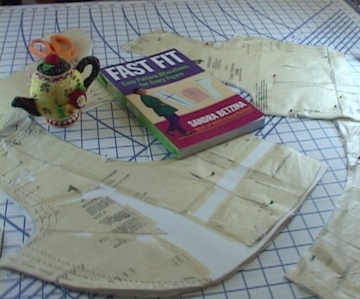 She took my measurements, and using the Vogue pattern piece, and the book pictured here "Fast Fit" by Sandra Betzina, she designed a new pattern. From now on when I sew anything from this pattern, i'll be using the new enlarged customized pattern, and it looks like I'll be making many of my patterns in the future. 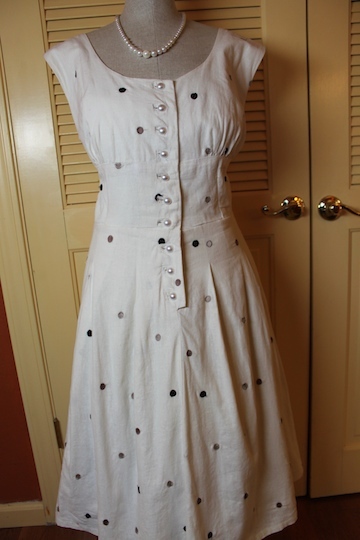 This is the upper part of the Brown Polkadot Dress. This is the first time i'm sticking by the pattern in keeping with the buttons. Diana assures me, it will be fine with my double D's, as long as there's enough buttons. 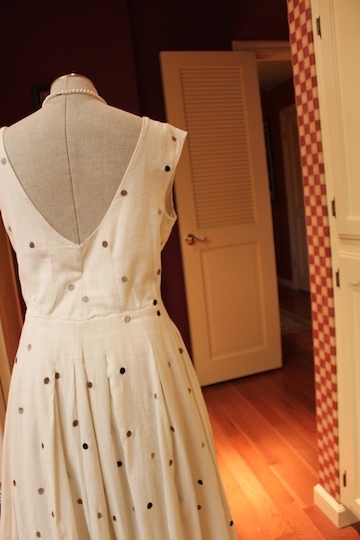 We did make the neckline a bit higher in front and back as with the sheet dress. I learned a lot of good stuff from Diana Stasko. I had a few bad habits developing, and she quickly broke me of them, but that's another story. 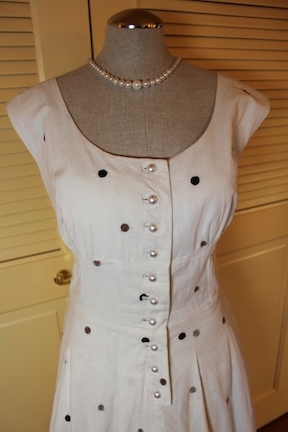 I love these pearl buttons. I've had them for awhile, not knowing how or what i'd use them for, but I knew they would make something very special. Since this fabric is 100% linen, and is meant to be a casual but elegant cool summer dress, I wasn't sure if these were the right buttons, but I loved them and I already owned them, so that's what I went with. Up to now I had been sewing all the things I made with this Vogue pattern, without the buttons as they are here. Although they were one of the things I loved about the dress, I had convinced myself I was to big on top with dbl D's to consider a bunch of little buttons. That was why I put snaps on the Red Hat Blouse, Bra Hooks on the Sheet Dress, an elastic neckline on the Picnic Dress, and a zipper on the Pink Polkadot Dress & the Gold Dress. 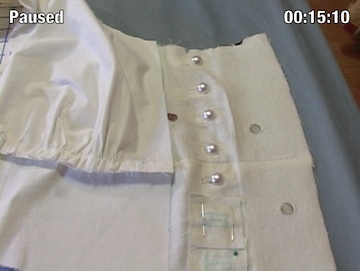 My sewing teacher said we could do it with the pearl buttons, but would need to add 2 or 3 buttons to the pattern to make up for a larger bust size. She was right. The dress fit perfect, and the buttons were fine. I planned to wear this dress in the SF Columbus Day Parade, where my daughter Sierra, would ride as incoming Columbus Day Queen. Since she was in the parade, there happened to be an extra place for mom and dad. I wore the dress, and it fit perfect. Only one problem! The neckline started to stretch. Later I would learn we should have stay stitched the neckline. It's not mentioned in the Vogue pattern, and my teacher and I both overlooked it. Goes to show you, mistakes can happen to the best of us. I love the dress and plan to wear it plenty this summer. I will need to address the neckline. I'll probably take the easy route and add a trim to the neckline, or just do a plain top stitch to stop it from stretching. I learned so much from sewing teacher, Diana Stasko at Better Living Through Sewing (SF Bay Area). The details, the patience, and setting up the project with the right fit, were some of the big lessons. She also broke me of a few bad habits, like trimming bits of fabric off the cut pieces. Sometimes things stretch, so she showed me how to manipulate the fabric back to it's original place, instead of snipping. Anyway, i'm very happy with my Brown Polkadot Dress.